Mouthpiece buzzing is a useful method, not only to improve your trumpet playing technique, but also to train the synchronization between inner hearing, airflow, and trumpet. I approach mouthpiece buzzing from two perspectives. Here, the idea is to use mouthpiece buzzing to improve certain movements or processes within your body‒such as airflow, changes in air pressure, and sound quality‒to develop efficient ways of producing sound. It is most important to do it with the highest quality in mind. The sound should be “clean,” so there should be no additional noise. Your throat shouldn’t make any noise; you want mostly sound and as little noise as possible. Pay attention and don’t do too much to produce a sound. For example, if you have to cramp your neck or shoulders, then you’re doing too much. If you have to create tension to be able to buzz on your mouthpiece or if your throat is producing noise, then you must change your approach. Otherwise, you’ll train yourself to be tense while playing and not to let the air flow freely, which is definitely not what you want. So, pay attention to achieve the highest quality. 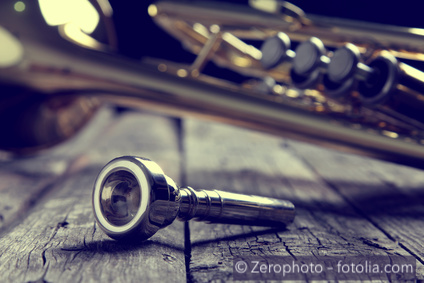 The second method to buzz on the mouthpiece is based on the “Song and Wind” principle, in which your inner hearing of the music is translated into sound using air. You can train or check your internal awareness of the music (song) by simply singing it. Wind can be trained by blowing air patterns without your trumpet, while simultaneously “singing” the music inside your head; “song” leads, and “wind” follows. To take it a step further, you can combine both elements on your mouthpiece by playing the melody on it. The good news is, if there is any vagueness in your imagination or inaccuracy in your way to use air, you will hear it instantly‒there will be wrong notes, they will be out of tune, the sound will break off, there will be noise, sound quality will suffer, and so on. YES, this is good news. Because becoming aware of these things is necessary if you want to improve! There are two useful ways to apply mouthpiece buzzing. Which one will you try in your next practice session?